Georgetown entrance to Morningside to left on Bellemeade. Ready for a full time vacation? You'll feel like it in this home!Beautiful log home with rustic interior. 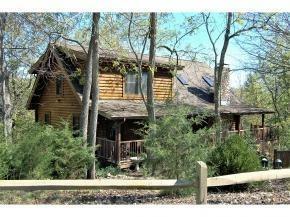 Set on almost an acre, left in it's natural wooded environment. Interior has wonderful beamed ceiling, wood flrs & of course, a stone fireplace! Updated windows & doors. Exterior has extensive porch/deck/patio for outdoor enjoyment. NOTE: This property was sold on 1/18/2018 and is no longer available. The details listed below are believed accurate to the date of the sale and are subject to change.